This final blog of 2008 is to wish everyone a joyous holiday season and say thanks for all the comments over the past six months and all the words of encouragement regarding the historical pieces, most of which combined facts, anecdotes, and personal recollections of the horses and the people. It seems most people have enjoyed looking back -- those who didn't get a chance to see some of these horses and those who did and might have learned something about them they didn't know before or just enjoyed reliving those days. I also enjoyed everyone's own personal experiences surrounding the horses and people. I hope to come up with more stories of this kind in 2009. Just to look back, in case you missed any, there were stories (in chronological order) about Dr. Fager and Damascus in the Suburban; Secretariat at Saratoga and his old grooms at Meadow Stud; Prove Out; Dr. Fager and Saratoga; a retrospective on post 9/11; Lava Man; a two-parter on Tiznow's two BC Classic wins; Wanderin Boy; Invasor; Volponi's BC Classic; Alysheba; Graustark, His Majesty and Darby Dan Farm and my first job in racing at DRF; Jim French; a two-parter on Canonero II; Spectacular Bid; Holy Bull; a two-parter on Cigar; and Skip Away. 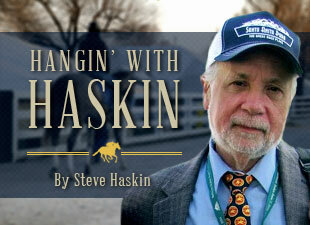 They are all archived under "Hangin' with Haskin" under the blog stable. I already have a bunch in mind for next year. I would like to close out the year with a poll. The reason for conducting this poll will be discussed after everyone has voted. The NTRA has instituted a new form of voting for the Eclipse Awards, in which all votes are conducted online, with a drop-down list of horses or people in each category to choose from. There is also a "write-in" option, in case you wish to vote for someone not on the list. Who would you vote for for leading owner? I will not burden you or distract you with earnings and other statistics. This simply is who you feel is deserving of owner of the year for whatever reason you choose. Let it be known I am not a fan of awards and pay little attention to them. But in this particular category I am curious who the fans would vote for. Again, the method behind my madness will be revealed once the voting comes to a halt. If you wish to comment on the reasons behind your vote, that would make it all the more revealing and interesting. If you wish to spice it up even more, you can also comment on who you didn't vote for and state the reasons why. I'll be back to discuss it at the end of the year and also offer a final New Year's wish.